How lucky we are to live in a time when we can learn from so many venues. Being able to share with you my collection of quilts, and the knowledge I’ve learned, is my way of passing on the “Gifts of Love” I have received. 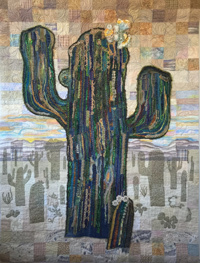 - View my Sonoran Sunrise that was recently a part of the Sonoran Safari Exhibit.